Since the spring of 2013, Waupun Fine Arts has been working in cooperation with the Waupun Public Library in offering display space for Wisconsin artists in bi-monthly shows. 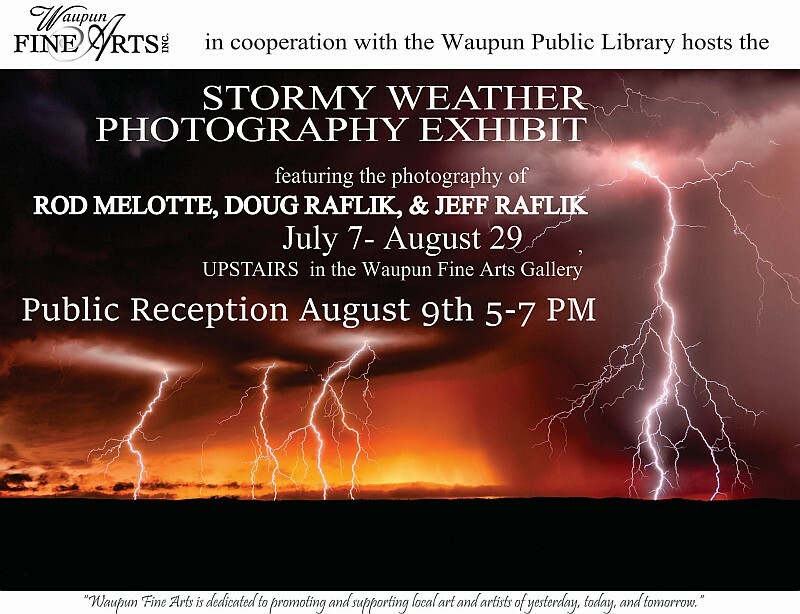 My stormy weather photography will be on display during the months of July and August, 2017, along with two other photographers, my brother, Doug Raflik from Waupun, and Rod Melotte from Columbus, WI. My photography will be displayed in two different sizes, and can also be purchased through the library staff, for pick-up after the exhibit. Artist's Reception - August 9, 2017 5-7PM. Meet the artists, while viewing the exhibit. Snacks will be provided. Forest Street intersects with Main Street a block east of the Shell station. Go south on Forest Street as far as you can go (two blocks), and the library will be on your left. You can check out the Waupun Public Library's website, at www.waupunpubliclibrary.org/. This page is designed and hosted by Jeff Raflik Photography, Waupun, Wisconsin.